NEW YORK (AP) — The Nets arrived in Brooklyn six years ago with big boasts about winning over New York and eventually winning a title. They don’t say much now at all. There are no promises about how much they will win or how soon. In fact, they don’t even really talk about winning. The goal remains to be better, which isn’t quite the same as being good. The Nets are content to do things slowly, knowing there are no quick fixes to the problems their former win-now attitude created. So it’s all about improvement, just as it was last season. Brooklyn did that last season, making a seven-win improvement that trailed only Philadelphia among Eastern Conference teams. But that still left the Nets at only 28-54, and it’s hard to see them doing much better than that this season. But the won-loss record won’t determine how the Nets define success. Indeed, the Nets are set up well for the future. They are finally done paying off the huge ransom they sent to Boston in 2013 in the ill-fated trade for Paul Pierce and Kevin Garnett, when the Nets were desperate to win quickly following their move from New Jersey to Brooklyn. They will have their own draft pick for the first time since and then plenty of money to spend on what’s expected to be a strong 2019 free-agent class. The Nets probably need to come away with someone good in one if not both spots to really make significant strides. Along the way, maybe they’ll find some keepers on this team. BLAZERS’ TRAIL: Allen Crabbe had the best season of his career — and most prolific 3-point shooting season in franchise history — after the Nets acquired him from Portland last summer. Brooklyn will try two more former Trail Blazers this season after signing Ed Davis and Shabazz Napier. TURNOVER TURNAROUND: Atkinson said forcing more turnovers will be a goal this season after the Nets ranked 30th in the league in that category in 2017-18. 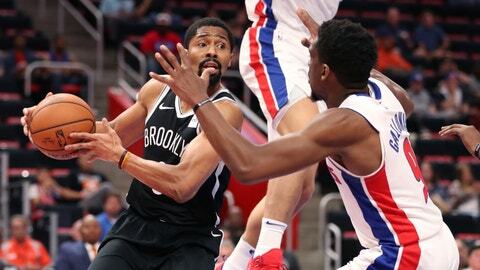 SPENCER’S SITUATION: Spencer Dinwiddie became the starting point guard following injuries to Jeremy Lin and D’Angelo Russell last season and ended up third in the league in voting for Most Improved Player after averaging 12.6 points and 6.6 assists while finishing second in the league in assist-to-turnover ratio. But he’s back to the bench now behind Russell and will have to be productive in fewer minutes and with teams more prepared for him. WAITING GAME: Russell and starting forward Rondae Hollis-Jefferson are eligible for contract extensions this month, but Marks indicated the Nets would probably not offer them now, instead saving their cap space for next summer with the option to re-sign them then as restricted free agents. NEW YORK, NEW YORK: The Nets can get an early jump on the city rival with two matchups against the Knicks in their first seven games. They host New York in their Oct. 19 home opener and make the short trip to Madison Square Garden on Oct. 29.